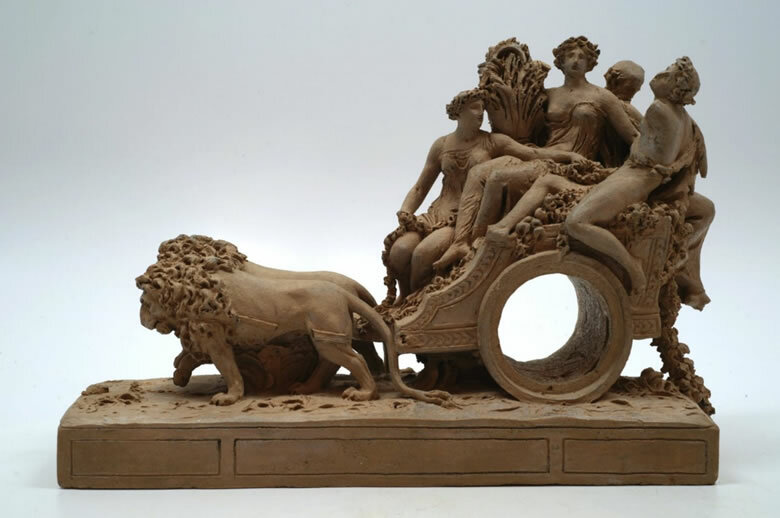 (“LX Item a model for a clock of modern composition representing a chariot pulled by two lions and carrying four figures of the four seasons used as a model to be executed in bronze two hundred forty francs, cy”). From Lemonnier. A large bronze version from the Musée des Arts Décoratifs was in the Cast in Bronze exhibition held at the Louvre and the Metropolitan Museum of Art in 2009; it was possibly the chef modèle used by Thomire to fabricate the clocks. The present terra cotta is mentioned extensively in the catalogue. Versions of the clock are in the Hermitage, (signed by Thomire), the Spanish royal collections and elsewhere. P. Lemonnier: Weisweiler; Paris, 1983. Page 164.